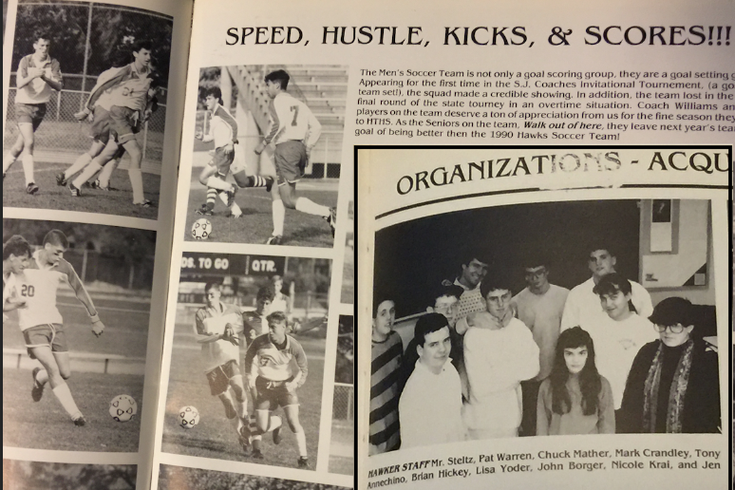 Brian Hickey played soccer (upper left) and edited the high school newspaper (getting strangled) but doesn't think he should have gotten a varsity letter for both activities. I played soccer and tennis for the mighty Haddon Township (N.J.) Hawks High School athletic program – starting left striker and second doubles, respectively. I wasn’t what anybody would call an exceptional athlete. Playing in the World Cup or at Wimbledon was never on the table. Serviceable in a supporting role is more like it (but for that awesome goal I scored late in the 1990 South Jersey group semifinals; happy to morph into Al Bundy mode and talk about it anytime you’d like, folks). I was also editor of the high-school paper (the internationally – nay – galactically respected “Hawker”) and read the morning announcements school-wide during homeroom amid a bunch of other college application resume builders. That’s what I got to thinking about when I saw Kevin Shelly’s story on Friday morning about a legislative push to expand varsity letter awards to non-athletic extracurricular activities in New Jersey school districts. The measure – sponsored by state Sens. Diane Allen (R-Burlington) and Christopher “Kip” Bateman (R-Somerset) – went to the Senate Education Committee on Thursday. This bill requires a school district that includes any of the grades 9 through 12 to adopt a policy to provide that a student enrolled in those grades who participates in any school-sponsored, interscholastic extracurricular activity that includes competitions in which the student competes against students enrolled in schools outside of the district may be eligible to earn a varsity letter awarded by the district. The committee went on to amend it so as not to make the potential legislation mandatory, which was a good move, but still doesn't make up for its consideration in the first place. My knee-jerk rejection stems from another fountain. But there isn’t a Nobel Prize in Free Kicks or an Academy Award for Best Supporting Tennis Player. Nor should there be, even if free kicks and supporting athletic roles carry the same level of importance as physiology or Best Movie Score. It just seems excessively unnecessary to change the nature of what’s been an athletics-focused tradition, particularly since there are awards specific to other extracurricular activities which exclude sports. If you’re going to give varsity letters to non-athletic activities, should captains tasked with being the team’s intermediary with referees be eligible for debate-team prizes? How about arts awards for players who draw up new plays on the fly? Bank shots in basketball involve angles, so should they be up for mathematics awards? Yes, athletic-footed and academic-minded students are each valuable to the school, community and world, but their pursuits fall into distinctly different camps. So, why the pressing need to take an award that’s long celebrated success for one group and extend it to the other? The real reward from high school was how it prepared me for the real world, and that's way more valuable than the red H.T. varsity letters I have around the house somewhere, but serve no greater purpose than trinkets and mementos. If legislators want to do something really valuable for kids, focus on pressing matters like funding fairness instead of co-opting tradition to make people feel better about themselves.